Woodbridge, United States - January 22, 2019 /MarketersMedia/ — Gifts should fit the personality and needs of their recipients. For instance, hikers, campers, and hunters tend to appreciate gifts that match their outdoorsy, adventurous lifestyles. Adventures such as backpacking and camping entail the concept of “lightweight packing.” This means that only the essential items are packed. However, adventures always expose an individual to a wide range of accidents and possible injuries, making gifts such as first aid kits favorably accepted by outdoorsmen. One of the companies sought after for their high-quality survival and preparedness gear is Surviveware. The company offers first-rate Small First Aid Kits that address the issues of outdoorsy individuals. The company offers first aid packs that fit the active and dynamic lifestyle of people who are on-the-go. Surviveware’s small first aid kit is compact and lightweight so that it fits in any hiking pack, rucksack, or day pack. Weighing only one pound, this life-saving kit is easy to carry and won’t weigh down hikers. This first aid kit might be light, but it holds enough items to last many trips. Surviveware’s kit contains 100 essential supplies for treating wounds and injuries sustained from adventures. The pack holds high-quality bandages, steri-strips, adhesives, and wraps. These are crucial provisions that can help patch up abrasions and scrapes sustained from rough terrain. The kit keeps first aid tools such as tweezers, safety pins, shears, a tourniquet, triangular bandages, and a removable CPR Kit. This small kit also holds other supplies for cleaning wounds and relieving insect bites. Weather is one of those things that adventure seekers always need to take into consideration. It is important that the items they’re bringing are waterproof and can withstand regular wear and tear. Bearing this in mind, Surviveware makes use of 600D polyester fabric to house their kits. This material is water-resistant and helps to prevent moisture from ruining the medical provisions stored within. Since the kit is made from durable material, it won’t crack, break, or tear under pressure. It is also malleable enough to be stuck in one’s hiking pack without occupying too much space. Surviveware’s Small First Aid Kit also has MOLLE-compatible snap-on and straps to secure the kit on belts, roll bars, tents, and hammocks. For individuals who go on camping trips, this an important feature, as doing so makes the first aid pack more accessible. 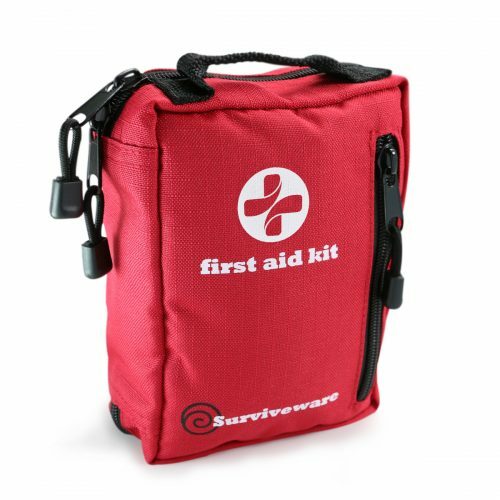 Solve your gift-giving issues and let your loved ones know how much you care by ordering Surviveware’s Small First Aid Kit. Enjoy a 20% discount when you use Surviveware’s Amazon discount coupon. Click here and grab your kit now!